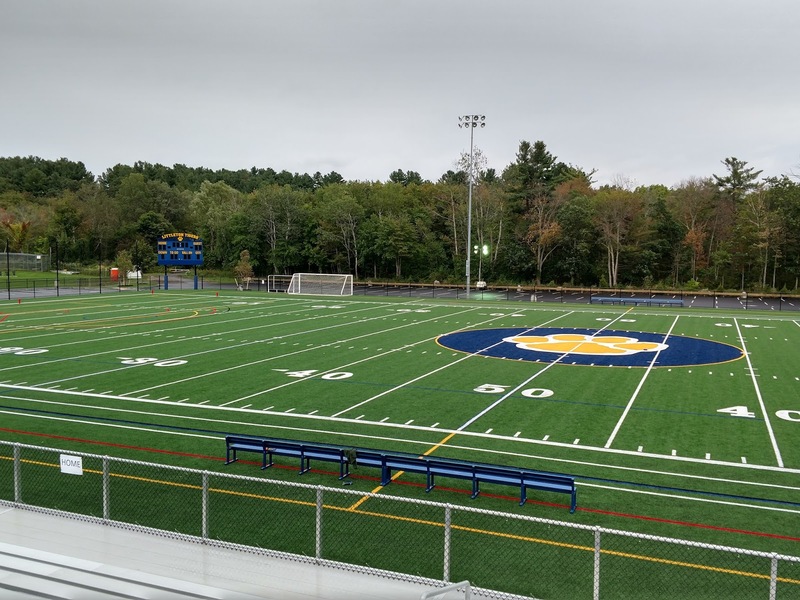 Littleton opened up the new-look Alumni Field Friday night. LITTLETON - Mike Lynn's demeanor never allows him to get too high or too low when it comes to directing his football team. But on Friday night, the 16-year head coach and athletic director of the Littleton Tigers could not help but feel a bit giddy on two fronts. 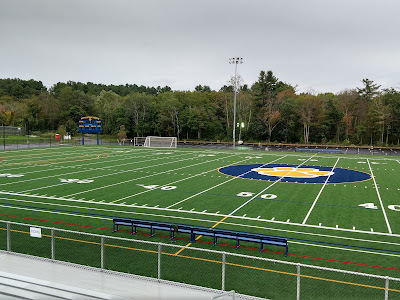 First was the grand opening of refurbished Alumni Field, following a 4 million dollar renovation project, which provided a brand new multi-purpose turf field, ample seating and plenty of room for parking. Second was watching his squad do a number on an improved Oakmont Regional team with a dominant 22-0 triumph. Right now, everything is A-OK in Lynn's world. "It may sound dramatic, but this field is changing our lives here," said Lynn. "All of our team sports have been out here for at least one practice if not two. The exuberance you see from the kids is overwhelming. We are so grateful for the town to allocate their resources to provide this facility for our coaches, and most importantly, for our kids." In a battle of Mid-Wach C Division unbeatens, it was the Littleton (3-0) having the first and final laughs in this one. The Tigers opened this tilt up by jumping out to a 14-point lead in the game's first 10 minutes before defense, on both sides, would take center stage. It just so happened that the Tigers defense was several steps ahead of the Spartans. Littleton held Oakmont (2-1) to a measly 65 yards as it bottled up the Spartans' bread and butter rushing attack. Having last met back in 2010 in the Central Mass. Division 3 postseason semifinal, won by the Spartans, this crucial early-season showdown would give the victor a huge step up in the early season standings. Although not dominant in its running game, Littleton still managed to do enough by securing ball control and chewing time off the clock. The Tigers' patented double-wing offense was spearheaded by their leading back Bradley Klock, who gained 107 yards on 18 carries. The workhorse senior continued to sustain drives while keeping Oakmont's defense on the field. As a group, the Tigers finished with 274 yards. Obviously pumped up for the pregame field dedication festivities and overflowing crowd on hand, Littleton was able to hop on the Spartans early. During its opening possession, Littleton put forth a methodical drive, continuing to pick up positive yardage along the way. A 37-yard jaunt by senior Kevin Frisoli set up his own 1 yard scoring plunge just 7 minutes in. Following Klock's conversion scamper, Tigers went up 8-0. Frisoli, who got dinged up, only played the initial half, finishing with 41 yards. "Obviously that affected us on offense," Lynn said. "But we always have the double-wing offense as a fallback. Tonight it was good for us as we were able to move the ball enough. We'll never abandon it." Moments after the Tigers scored, Frisoli, off a bad shotgun snap by the Spartans, recovered a fumble on the Oakmont 40. A 34-yard run by starting quarterback William Scott moved the ball to the Spartans 6, setting the stage for Klock to run it in and increase Littleton's advantage to 14 points. "We got the early momentum mostly due to our home opening night and new field," said Klock. "I mean look at this crowd that was here tonight. It's pretty amazing. This team really stuck together throughout and I've got to give a lot of credit to our offensive line. They are big and fast and were awesome tonight which allowed me to find some holes." Early indications that this would become a blowout were fabricated. That is because Oakmont's defense received a wake-up call following the touchdown and tightened things up. On Littleton's final three possessions of the half, they were forced to punt. However, the Spartans offense failed to capitalize on those opportunities. The offense, led by quarterback Tim O'Connor (3 of 11 for 30 yards), along with running backs Jamison McCartney (8 yards) and Justin Jameson (19), was plagued all evening long by a staunch defensive front and secondary. In fact, the Spartans, during the opening 30 minutes, made it across the 50 yard line only once. "Our motto all week was that the party was in their backfield," Tigers defensive coordinator Carlo Ferrante said. "We played aggressive and we wanted to get into their backfield before their quarterback could do anything. We wanted to get into the backfield before they could create anything and I thought our kids did a fantastic job in doing that." The final half was much of the same. Oakmont, switching in four different quarterbacks at different intervals, continued to sputter. But early in the third, the Spartans caught a huge break after defensive back Mike Hatzopoulos intercepted a pass and returned it 25 yards to the Littleton 13. But all Oakmont could muster was just 3 yards before turning the ball over on downs. A short time later, the Tigers saw a golden opportunity to add to its total stall on the Spartans 24 yard line. Nevertheless, the way their defense was holding up to its end the bargain, a two touchdown lead appeared safe. With time ticking away late in the fourth, the Tigers had another chance to tack on more points. Following an Oakmont punt, Littleton got the ball at mid-field. Behind some nice runs from junior Austin Lynn and Klock, the Tigers reached the 3 before Klock barreled over the goal line. Lynn's ensuing conversion run put this game on ice. "Their defense played a phenomenal game and we could never get ontrack offensively," said first-year Spartans head coach Derek Asadoorian. "Our chance was when we got that interception, but they stepped up and we couldn't make it happen. I thought our defense played well but our offense put our defense in some really tough situations tonight. We just couldn't find the end zone."